As a mom and a woman, one of my favorite gifts are gift baskets! They can be so much fun to open. There’s just something exciting about having several themed items in a basket. If you don’t have time to create your own basket, but would like a thoughtful, good quality mother’s day gift basket, I have the answer! GourmetGiftBaskets.com! Who wouldn’t want to receive this beautiful fruit gift basket! 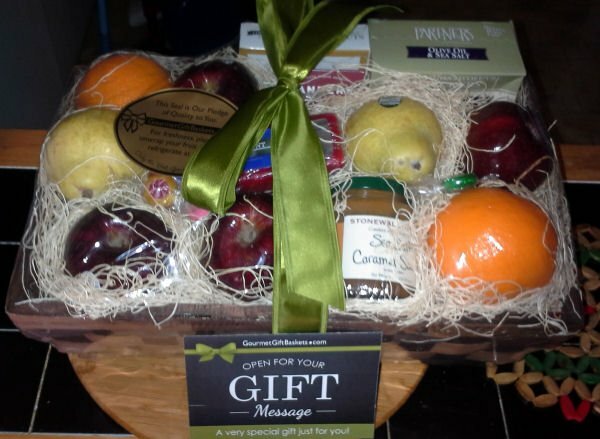 I had the opportunity to review this beautiful Orchard’s Abundance Fruit Gift Basket! The basket itself came with a message from the president of the company, and was packed very securely so it would not get damaged during shipping and topped with a bow. Each gift basket comes with a card inside that you can add your personal message to the recipient. I have tried each of the fruit and it was wonderful to be able to eat juicy delicious pears (haven’t been able to find that in a while), juicy oranges and delicious tasting apples! I need to go out and buy more, these made me want to have more real fruit instead of fruit cups in my home! I’m not a big Sea Salt or Caramel person, so my husband when he’s feeling better plans to try the dip and candy. I’ll update this review when he does. With something for everyone, it’s no surprise that this delightful gift is one of Gourmet Gift Baskets most popular! Inside their signature woven basket, they’ve artfully arranged juicy oranges, crisp apples, and sweet pears, along with an assortment of delicious gourmet foods. Complete with Vermont cheddar cheese, premium Virginia peanuts, and a salted caramel dip, this classic arrangement is perfect for any occasion. · Fresh Orchard Fruits – Two juicy oranges, four crisp apples, and two tender pears that are hand-picked from premium orchards. · Sea Salt Caramel Sauce by Stonewall Kitchen – 12.25 oz. – An excellent dip for fresh cut fruit, with the smooth rich taste of sweet caramel with a touch of gourmet sea salt. · Classic Vermont Sharp Cheddar Cheese by Cabot – 8 oz. – A robust Vermont cheddar cheese that’s carefully aged to achieve a distinctive award-winning flavor. · Deli Style Hors D’Oeuvre Crackers by Partners – 4.9 oz. – Thick and hearty rectangular crackers that are baked until evenly golden. · Milk Chocolate Sea Salt Caramels by Sanders – .5 oz. – Gooey caramel is enrobed in delicious milk chocolate, then delicately sprinkled with sea salt. · Roasted & Salted Peanuts by J&R Gourmet – 2 oz. – Classic peanuts that are evenly sprinkled with salt and gently hand-roasted. · Chocolate Covered Cherries by Marich – 2.3 oz. – Sweet all natural cherries get even sweeter when dipped into milk chocolate. · (5) Assorted Citrus Slices by Primrose Candy – Individually-wrapped hard candies that delight with vibrant fruit flavors. 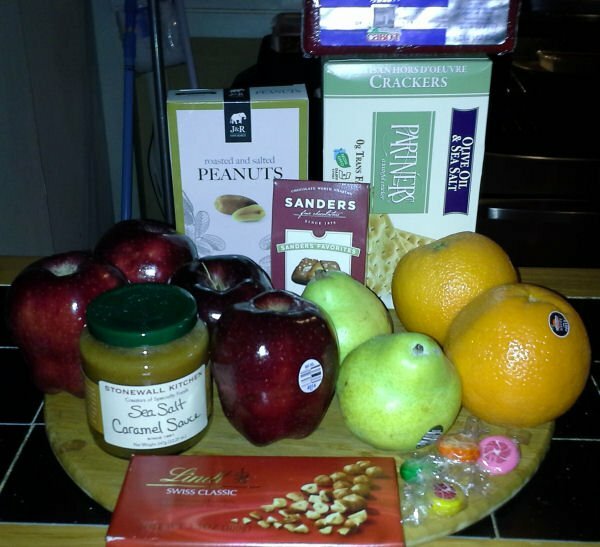 I can tell you, when I received the basket, I thought it was beautiful, after eating just the fruit, I want more! This fruit gift basket is perfect for any occasion and for any one! Be sure to order soon for Mother’s day arrival! Order today (5/4) and it can be delivered tomorrow (5/5)! Be sure to check out more product reviews!